Its model number and name are #005 / Zangief. Character Bio - Born and raised in the Soviet Union, Zangief is incredibly patriotic and motivated to fight for his Motherland. Zangief is a massive fighter, weighing 254 lbs. and standing slightly over 7 feet tall, placing him among the tallest characters in the entire Street Fighter roster. His massive frame is almost entirely covered in scars from his bouts with brown bears in the barren and remote area of Siberia. 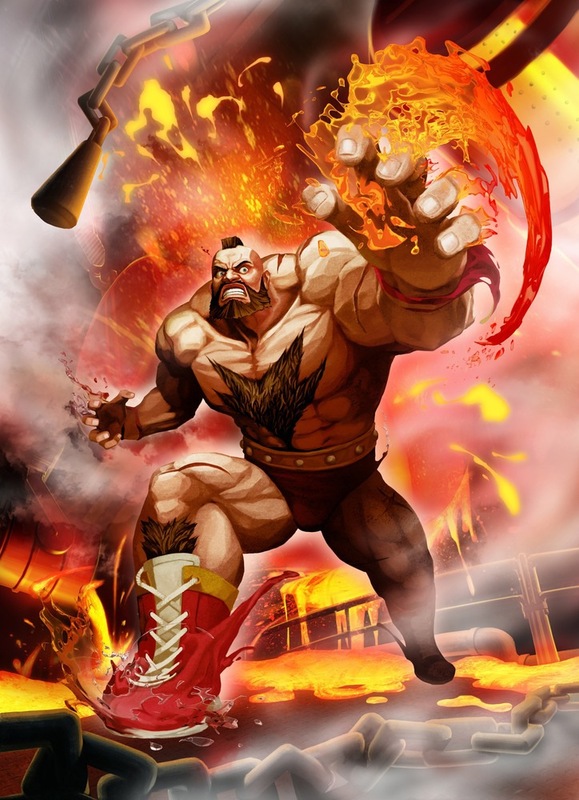 Zangief is a fearless fighter with a quick temper, and is always very competitive. Zangief is immensely proud of his physique, and constantly belittles his opponents' less-muscular builds. Despite his short temper, Zangief has shown himself to be rather gentle-natured with a good sense of humor at times, once entering a tournament partly to win the admiration of a group of school children. While not fighting, Zangief enjoys cossack dancing, vodka, and borscht. As a Human, Zangief has these Human Synergies. As a Human, Zangief interacts differently with these special powers. 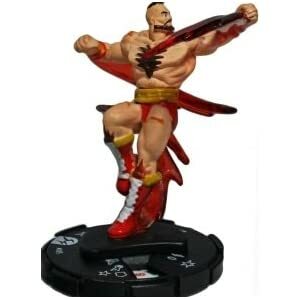 As a figure with a special attack, Zangief can interact differently with these special powers. Tiny, large and huge figures are not affected by Zangief's Grappling special power. Current tiny, large, and huge figures. Tiny, large, and huge figures are not affected by Zangief's Spinning Piledriver 16 special power, and figures with the Super Strength special power are less easily affected by it. Current tiny, large, and huge figures; and Current figures with the Super Strength special power. Last edited by Ronin; October 16th, 2018 at 06:11 PM. Instead of moving, you may switch Zangief and any small or medium figure he is engaged with. Switched figures never take leaving engagement attacks. After choosing an adjacent small or medium figure for a normal attack, and before rolling attack dice, you may roll the 20-sided die. Subtract 2 from your roll if the defending figure has the Super Strength special power. If you roll 16 or higher, the defending figure cannot roll more than 2 defense dice against Zangief's normal attack this turn. If Zangief inflicts one or more wounds with this special attack, you may use this special attack one additional time. Last edited by SirGalahad; April 28th, 2014 at 12:17 PM. - I'd prefer "Bruiser" or something else to "Brawler," since he's a professional and used to one-on-one fights rather than brawls. - "Grappling" over "Grapple" to match with Apokolyptian Grappling. - "Double Lariat" over "Spinning Lariat" to more closely match the games. - Some sort of provision to prevent using Piledriver and Lariat in the same turn, if only to make it more of a choice. - Not sure if we want him with 5 Life. I don't mind it but it's sort of against our status quo. But other than fiddly stuff, two thumbs up! I like it; looks good! This doesn't even really come into play. Piledriver is already only in affect with a normal attack and Lariat is a special. No problem with the other stuff. I think 5 life seems fitting to the design though considering he has no defensive powers, slow movement, and no synergy to speak of. Plus he's huge! Definitely agree with all of Johnny's points, and nice comic art! Before attacking, you may switch Zangief and any small or medium figure he is engaged with, if possible. Switched figures never take leaving engagement attacks. And I see Piledriver is also before attacking. Maybe they should be combined? Before attacking, you may switch Zangief and any small or medium figure he is engaged with, if possible. Switched figures never take leaving engagement attacks. After switching, roll the 20-sided die. If you roll 16 or higher, the switched figure may roll no more than 2 defense dice when attacked by Zangief's normal attack this turn. Last edited by quozl; November 9th, 2012 at 07:17 PM. There's no size designation. He should be Medium; otherwise no ladders and exempt from a ton of special powers. I do not think they should be combined, because it requires you to switch figures in order to roll. I would prefer the option of educing defenses without having to switch positions.